Free standing 180° inverter with single clamping table. Loaded and relocatable by forklift truck. With a 2 tonne capacity the FS Inverter is available in 3 standard jaw opening sizes with levers, push-button, remote or automated controls, or it can be built entirely to your specification. All FS Inverter machines are painted with two coats of zinc primer and a 2 pack epoxy acrylic top coat as standard. The FS Inverter is ideal for boxed, bagged or canned goods, and is versatile enough to handle everything from yoghurt and biscuits to bottled wine or cement. Use the FS to switch from wood to plastic pallets, to recover damaged product from the bottom of the stack or to add flexibility to your distribution pallet policy. We can build the FS with a stainless steel turning body or with a hot zinc spray rust-protected finish. Al Thika Packaging is the exclusive distributor of Premier Pallet system in the Middle East. Since 1994 Al Thika Packaging has been providing a wide range of machinery includes Pallet Inverters, Pallet Chargers, Pallet Dispensers and freezer spacer for food & non-food industries in Dubai, Abu Dhabi, Sharjah, Fujairah, Ras Al Khaimah, Ajman, Umm Al Quwain, Al Ain – UAE, Saudi Arabia, Muscat, Oman, Bahrain, Kuwait and the many other Gulf countries. The letters FS are short for Free Standing pallet turner indicating that the only installation involved is an electrical connection, and that the machine itself is stable under its own weight. 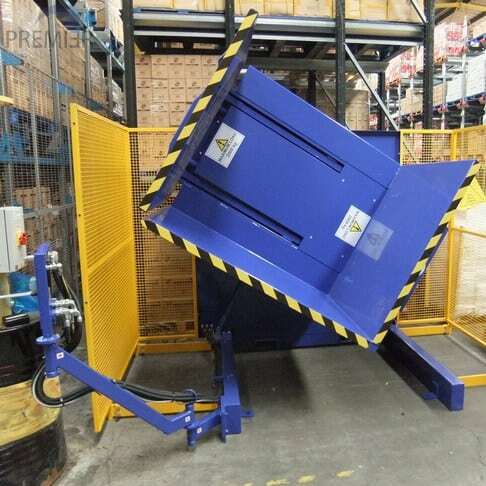 The basic and still the most popular pallet turner model is fitted with lever controls on a short arm. One lever operates the clamp and the other turns the load over 180 degrees. There are a number of control options including manual push button, fully automatic and remote control. The FS is the work horse of the range with more sold each year than most other styles of pallet turner systems put together. The tables are raised above floor level so it must load by forklift truck. It is available in 3 sizes of jaw opening with special models available above the normal standard maximum of 2.20m. The FS is simple to use, simple to maintain and above all has a very long lifespan. We have many machines in regular use 15 to 20 years after construction. 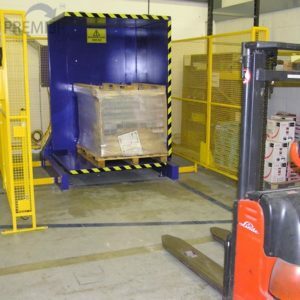 It will handle almost any type of palletized load and can exert a very high clamping pressure on slippery or unstable goods if need be. Premier maintain a permanent stock of new and used FS inverter (pallet turner) models, available at very short notice. The FS Inverter is ideal for boxed, bagged or canned goods, and is versatile enough to handle everything from yoghurt and biscuits to bottled wine or cement. Use the FS to switch from wood to plastic pallets, to recover damaged product from the bottom of the stack or to add flexibility to your distribution pallet policy. We can build the FS with a stainless steel turning body or with a hot zinc spray rust-protected finish.